Healthcare is an industry where constant technological change intersects with strict regulation and compliance. This is as it should be – not only are patients’ lives on the line, but so is their most sensitive data. For healthcare clinics and hospitals, printing often takes a backseat to medical device management and network infrastructure. Again, this is the result of an intentional triage perpetuated by the constant need to address patients urgently. For healthcare administrators, the amount of time spent researching and deliberating print asset acquisitions often leads to suboptimal device deployment and lack of collaboration. 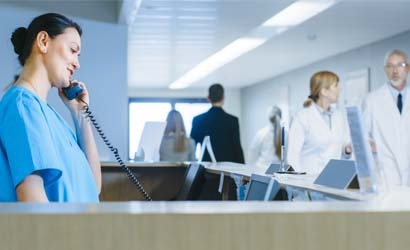 This can produce rippling effects throughout the organization, as care providers find it increasingly difficult to communicate with patients and one another through printed documentation. Managed print services give healthcare providers the ability to implement world-class print solutions that are both efficient and compliant. Managed print providers guarantee print uptime and automatically process consumable purchases as well as maintenance. The healthcare industry puts a number of unique stresses on print infrastructure. Not only do healthcare providers need immediate access to information when they want it, but they must also be sure that they protect sensitive patient data in the process. The data that healthcare providers depend on is both confidential and highly sensitive in nature. Healthcare infrastructure needs to comply with HIPAA and HITECH regulations. When regulations or technologies change, dedicated personnel need to address those changes within the context of the greater healthcare IT system. Downtime is not an option in the healthcare environment. Any vendor supplying IT services to a healthcare clinic must be able to guarantee device uptime. Preventative maintenance and just-in-time consumable delivery is part and parcel to this plan. Healthcare professionals cannot slow down to consider the per-page costs of printing patient documents. But healthcare administrators see those costs pile up and urgently need to assess solutions for controlling them. Organizational silos represent one of the steepest challenges facing the healthcare industry today. Integrated print fleet management can give healthcare organizations infrastructural support towards breaking down barriers between non-standardized electronic medical records and transferring data effectively between providers. In many healthcare environments, there is no accurate way to determine print usage for a given period of time. Without analysis of print usage, purchasing departments are flying blind, leading them to either overspend or underspend on print consumables. Healthcare IT technicians have their hands full. Between maintaining medical databases and ensuring that provider systems function, they simply don’t have the time for high-volume, low-impact tasks like print fleet management. Doctors, nurses, and laboratory technicians need to stay on top of technological developments that can help them deliver results faster and more accurately. Managed print services represent a critical step towards ensuring medical professionals enjoy access to the resources they need. Managed print services will relieve your IT and purchasing team of the responsibility for making accurate judgements about print equipment and consumables. By assessing your real-world print usage and enabling real-time visibility into print processes, your managed services team can order print supplies just in time and reduce healthcare print costs by finding the most efficient vendors for your devices. Automatic supply replenishment ensures that every department in the healthcare environment doesn’t have to wait for new supplies to come in and risk downtime. Print consumables come in exactly when they are needed, and a professional team of technicians ensures your print hardware is always stocked. Have a professional managed print service team assess your healthcare organization’s print usage. A comprehensive print audit can uncover opportunities to redeploy your print assets in a way that generates value and reduces waste throughout your entire organization. Find out how our team of imaging experts can help you optimize your print fleet. Start the process of reducing healthcare print costs today.